Same great juice, now in a CAN! 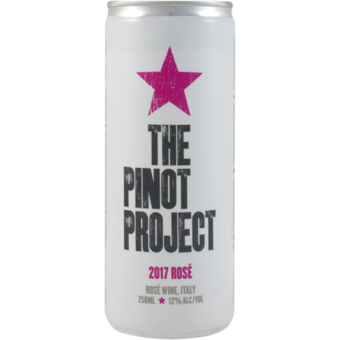 The Pinot Project Rosé is made from Pinot Grigio grown in the prestigious growing region of Veneto, Italy. The grapes are harvested at optimal ripeness then pressed, and the skins impart a lovely pink color due to an overnight cold temperature maceration. After the grape skins and must are removed, temperature controlled fermentation occurs in stainless steel. The wine is completely unoaked to maintain freshness. After being bottled, it rests for five months before release.